Sophisticated Indian: Brown Fantasy Dark Cabinets Backsplash Ideas. By having Brown Fantasy Hard Marble in kitchen remodeling, worry free backsplash selection and sophisticated look are yours. You will hit two birds with one stone. I would like to mention the similar countertop that has almost the same physical appearances with Brown Fantasy but different chemical compounds. This honor goes to Silver Travertine. Silver Travertine is also very good example for travertine countertops. Second place goes for the White Torroncino Granite. White Torroncino Granite has little darker feature if we compare with Brown Fantasy. For my opinion, all three can fit into the same backsplash ideas. The writing pattern is the same for my readers: First the material and the characteristics of the backsplash then, the color and stain of the dark cabinets will be defined under each picture. Delphic Exhibition: Brown Fantasy Countertop article has a chance to look up for other kitchen remodeling ideas. 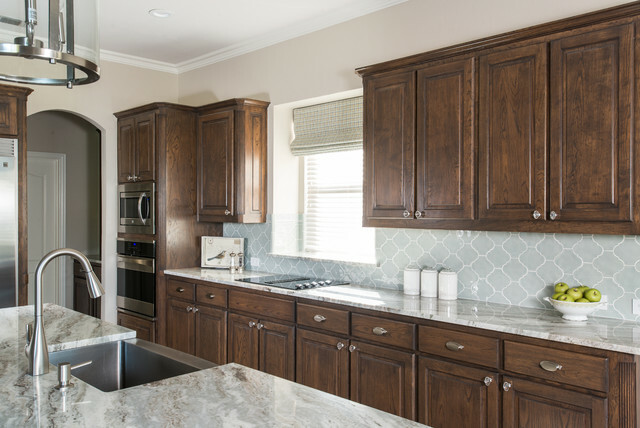 The backsplash colors for Brown Fantasy Dark Cabinets Backsplash Ideas can be grayish blue to give enough contrast, beige, natural tones and Brown Fantasy herself. The material for the backsplash can be ceramic, travertine, glass and hard marble. The type of the backsplash tile would be subway or brick tile, arabesque and full high backsplash. I kindly would like to remind the backsplash selection rule for flowing pattern countertops: Backsplash would be plain as much as possible or would be full high backsplash to give more bold and rich looking in the kitchen. It was not easy to find some delightful picture this time, so I have picked the sister countertops backsplash ideas for dark cabinetry too. Let me share my favorites of the Brown Fantasy Dark Cabinet Backsplash Ideas and Silver Travertine and White Torroncino Granite as well. Picture Credit: Bossio Stone Imports., Brown fantasy countertop with vertical set up white brick backsplash and expresso finished hickory cabinets. Flooring is a sweet pick as Metro Sand Porcelain Floor tile. Contemporary with minimalistic kitchen design style. Adorable looking. Design Credit: Kim Bailey Interiors LLC., by Michael Hunter Photography., I think transitional kitchen can carry the elegancy the best while talented designers combine all the design elements together. It is always safe to be in good hands. The Walker Zanger custom pattern from Tuileries Loire Crackle Collection. Three different backsplash has been used as brique liner, pearl liner, and arabesque tiles. Cabinet color: Sherwin Williams: Sea Salt – SW6204 with custom mix stain; 2 parts of Jacobean and 1 part of Classic Gray. 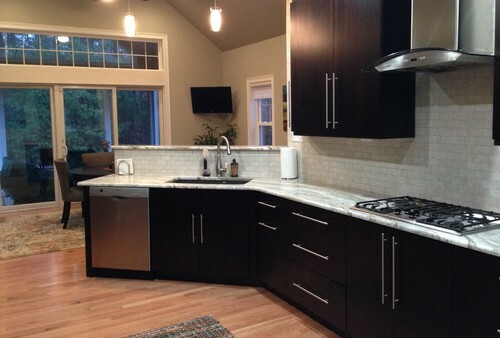 Gray feature is almost invisible in the cabinets but arabesque backsplash. All the puzzle is completed with wonderful Fantasy Brown Countertop and Islandtop. Picture credit: Cheerful Interiors LLC. via Houzz,. Dark cabinets is under the auspice of good designers. Onice, Beige Brick Backsplash and Brown Fantasy Hard Marble Countertop are pairing without any doubt. Flooring and cabinet stain details are coming, please stay tuned. 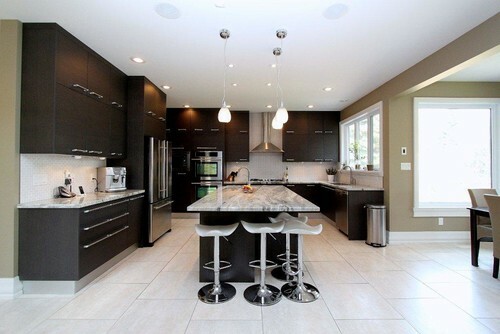 Very good example of Contemporary Kitchen Style especially the angled sink and sleek lines… . Picture Credit: Laura Hay Decor and Design LLC., This travertine is like a sister of Brown Fantasy. 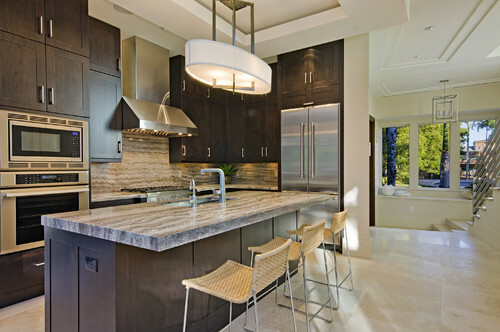 Vein Cut Silver Travertine is an excellent idea by using as a countertop, island top and full high backsplash. Espresso finished maple cabinets with matte stain makes this kitchen more beautiful.Floor is honed travertine but the color details will be shared soon. Whole scenic is very admiring. Please be cooperative by dropping comment about Brown Fantasy Dark Cabinets Backsplash Ideas. Thank you for your time.